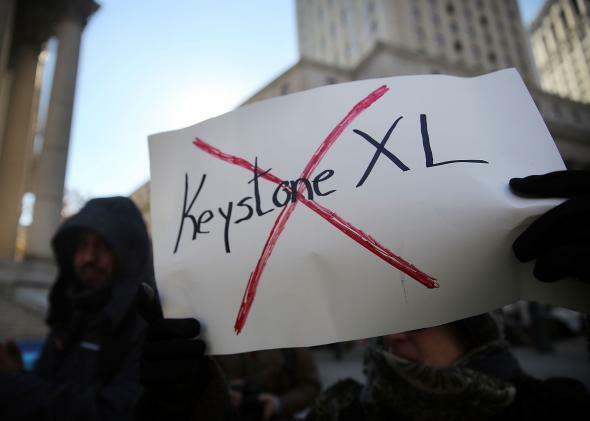 Senate fails to override Obama’s keystone veto. Wednesday’s vote is almost certainly not the end of Congress’s squabbling over Keystone, which became an unlikely wedge issue after environmentalists convinced Obama to use his executive authority to hold up the oil pipeline’s construction. North Dakota Republican Sen. John Hoeven said before the vote that “if we don’t win the battle today, we’ll win the war, because we’ll find another piece of legislation to attach this to.” And Democratic Sen. Joe Manchin—a Keystone booster who has given Republicans’ efforts a sheen of bipartisanship—pledged to bring up Keystone again later in the session, possibly tethering it to infrastructure or energy legislation. Despite Republicans’ persistent attempts to force Obama’s hand on keystone, it’s not clear that the pipeline is nearly as important, economically and environmentally, as it was a few years ago. Thanks to the precipitous decline of the price of crude oil, the oil industry is much less eager to pay to use the pipline in order to transport Canadian oil. Many companies, moreover, have already found alternate routes to transport oil. Although the company behind Keystone insists it still has customers clamoring to use the pipeline, that claim seems increasingly dubious. But it’ll be a warm day in northern Alberta before you hear any of these issues brought up on the Senate floor.